As you can see, this is only a very short story, so, luckily for you, this review will also be rather short. I was pleasantly surprised after reading the first couple of pages. The writing quality is really good. I could see it all happening very vividly. The characters, the surroundings: really well done! 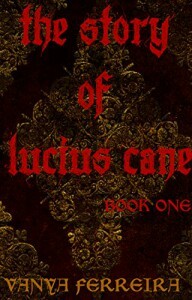 I think Lucius Cane could be in my top 20 of favourite antiheroes. I truly liked his character and he reminds me a little of the Marquis from Neil Gaiman’s Neverwhere. Except Lucius is a vampire, obviously. Because this book is so short and ends with a cliffhanger, there’s not really much left for me to say about it. I can highly recommend reading it as an in-between kind of thing; it’s entertaining enough, especially if you’re into paranormal stories. I would love to see a book two, three and four. Then, turned into a volume, I could most likely give it 4 brownies or even more. For now, I’m settling on a steady 3 brownies. A solid entertaining quick read. A big thank you to Vanya Ferreira for providing me with a copy of his book in exchange for an honest review!